I am very fond of the music of Carl Nielsen, and first came to love it by playing the horn in his magnificent Wind Quintet. Nielsen wrote it for his friends, and expertly characterised each of them with wickedly accurate musical pen portraits. The clarinettist was obviously a complete nut-case! Encouraged by the success of the quintet, the great Danish composer planned to take his idea of musical portraiture much further, with a concerto for each of the five musicians. Sadly, after composing the wonderfully assured Flute Concerto in 1926 for the urbane Holger Gilbert Jesperson, and producing a dark and troubled sound picture of the temperamental clarinettist Aage Oxenvad in 1928, Nielsen died before the remaining three concertos could be achieved. So far, with tonight’s Bassoon Concerto, I am two wind concertos ahead of my hero, and only have the Flute Concerto left to do. My Bassoon Concerto is not a musical portrait of the dedicatee Meyrick Alexander, though I have admired Meyrick’s superb playing for many years and have worked with him (and the English Serenata) on several CDs and concerts. The first movement starts gently with an exchange between harp and clarinet in 7/8 time. The strings enter, the tempo accelerates and the soloist introduces the main theme, a playful but fairly restrained tune that weaves in and out of its home key (F major) in ever changing 7/8 and 6/8 metres. An oboe offers a new slant on this and the soloist leads us into the first full orchestral tutti, and then offers a rumba-like second subject, which, with development of previous material, gives way to a gritty D minor episode that, in turn, leads to a central lyrical Andante con moto, at the end of which a fairly thorough recapitulation concludes the movement. There is no cadenza in the traditional first movement slot, but the second movement starts with a short passage for the solo bassoon toying with notes that go to make up the main theme, which is announced by the soloist over muted strings. The melody is folk-like, very English, and harmonically obsessed with ‘false relations’. A middle section seems to evoke mediaeval harmonies and rhythms, and the solo instrument takes on some of the qualities of its venerable forbears: the shawm, bombarde and pommer. The A-B-A form of this movement is completed by a harmonically ingenious coda that ends very quietly. The finale owes some debt to Nielsen and Sibelius. I was learning Sibelius’s Third Symphony when I composed it, and can detect some influence from that wonderful work. The movement is basically in E minor, though it ends with a flourish in C major. The progress to that conclusion is a fairly swift journey, interrupted by a lyrical episode for solo flute, with support from the harp and lower strings. A longer cadenza follows, and the orchestra hints at the 7/8 rhythm of the first movement, though not its melodic material. The pace hots up, and the minor tonalities give way in an unashamedly theatrical gesture, to a final triumphant major key statement. 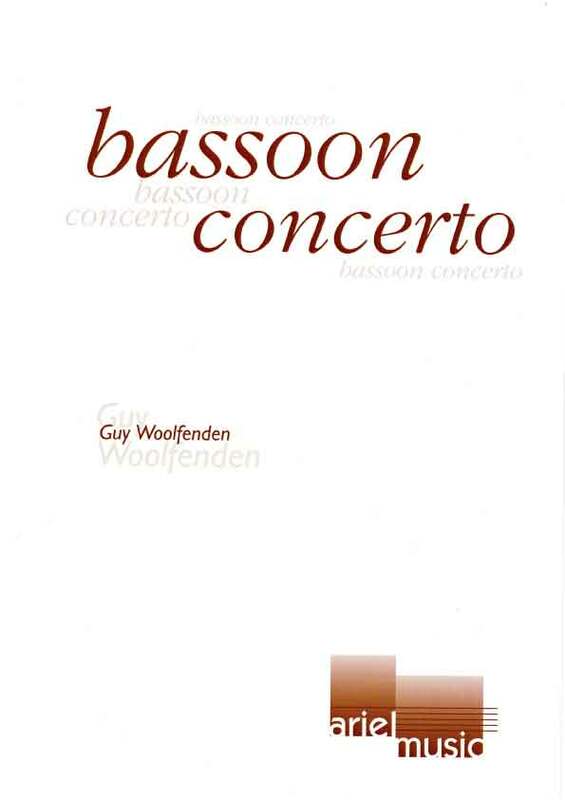 Better known as a composer of music for the theatre, Guy Woolfenden has a long association with the Warwickshire Symphony Orchestra, and on Saturday the orchestra and the excellent Meyrick Alexander gave the first performance of Woolfenden’s new bassoon concerto. The orchestra had commissioned this within the Arts for Everyone awards. Woolfenden’s programme notes pay tribute to the inspiration of Nielsen and the very evident influence of Sibelius, although the work remains firmly Woolfenden: a little theatrical, well-orchestrated, accessible, entertaining, and clever without being too clever. The first movement is characterised by an intriguing passage of changing metres and a fine main theme, a jovial and catchy little tune later reworked by the oboes. The second movement, a little shorter than the others, grows immediately from the first and is contented and harmonious, with a particularly charming coda. Sibelius’ influence appears early in the third, with its firmly contained energy and dark undertones. This movement has a particularly imaginative passage with solo flute and harp and more of the tricksy metres of the first movement, and a few bars towards the end which lack the clear coherence of the rest of this work, which is demanding for amateur orchestra. But with the composer very much in charge WSO was well up to it, with a balanced and full sound. Meyrick Alexander’s liking for the work resulted in a vivacious first performance of a very valuable new concerto. Those present at this concert were witness to a special event. Following a spirited performance by the Warwickshire Symphony Orchestra of Tippett’s Suite for the Birthday of Prince Charles, on strode Meyrick Alexander – Principal Bassoon of the Philharmonia – to begin the serious business of the evening. In three movements, this Concerto opened with a generally light-hearted affair. After a short introduction from the orchestra, Meyrick Alexander’s first entry gave the main theme of the movement. Skipping playfully between 7/8 and 6/8 metres, the orchestra sometimes found it hard to stay together, but some fireworks from the soloist soon distracted the audience away from any shakiness on the orchestra’s part. When the movement opened out into a glorious middle section, however, their accompaniment was superb, providing the ideal support to Meyrick Alexander’s lyrical solo lines, before returning to a much more cohesive interpretation of the opening material which brought the movement to a close. There was a complete change of character for the second movement. It began with a cadenza from the solo bassoon, ambling to begin with, before gathering momentum into the movement proper. Throughout, the mediaeval Englishness, which Guy Woolfenden wanted to evoke, came across very well. The main folk-like melody, spiced with ‘false relations’, was beautifully played by Meyrick Alexander with a rich lyrical tone, being accompanied by muted strings. However, both he and the orchestra were then able to allude to the sound of a mediaeval band with solo bombarde to great effect! Following an expressive tutti from the orchestra, the quiet coda brought to a close a very enjoyable movement. The Finale immediately dispelled the relaxed atmosphere of the second movement, and after a dramatic first entry from the soloist, continued with a driving pulse, complete with lots of impressive runs for the solo bassoon. Throughout, Meyrick Alexander made the most of some rich, low writing, particularly in the cadenza. Again, this began haltingly and was played with great dramatic effect, before launching into the last big tutti of the piece. There were still some fireworks to come, with big leaps and runs all brilliantly brought off by the soloist, to ensure a grandstand finish to the work. Throughout the Concerto, I was particularly impressed by the sensitivity of Guy Woolfenden’s scoring. The balance between the bassoon and the orchestra was extremely well judged, allowing Meyrick Alexander to bring out all the character of the piece. It is a pleasant and approachable piece to listen to and one for which I believe bassoonists will be grateful. Recently, Meyrick Alexander performed the Woolfenden concerto at an International Double Reed Society Conference, but here in its more accessible bassoon/piano arrangement one can enjoy the interesting rhythms and lyrical quality of the composer’s style more clearly. It is a delightful three movement (Moderato, Andante, Allegretto) work composed in a generally expanded tonal musical language. Guy Woolfenden (b. 1937), himself, is a hornist and composer, who has also served as music director of the Royal Shakespeare Company, for which he has written over 150 scores. Like his hero, Danish composer Carl Nielsen, he hopes to compose a concerto for each of the winds of a wind quintet, and has only a flute concerto left to complete. Sadly, Nielsen died after completing only the flute and clarinet concerti of the five he had hoped to write. Woolfenden has that expansively lyrical style, not unlike Nielsen and Finland’s Jean Sibelius, a style one often associates with Northern European music, which I personally like very much. His Concerto is a wonderful work, and it would be good for it to reach a greater audience. Hopefully this recording will enable it to happen. The three movement work has a first movement in a primarily 7/8 meter, a lovely lyrical second movement, and includes a nice cadenza in the last movement. The two qualities I admire most in Meyrick’s bassooning are readily on display in this CD. The first is the fact that there is absolutely never any cracking in his middle register notes, which are the result of very careful and precise venting. The second quality is the variety of vibrato (sometimes non-vibrato) that he uses, and whatever it is (or isn’t), it seems most appropriate for the given passage. Of course many other qualities are also present: great technique, nice phrasing, etc. But the above two really stand out for me, giving Meyrick a “signature” sound, which is a trait that few bassoonists, among them the late, great bassoonist Bill Waterhouse, had as well. Pianist Catherine Milledge also give a wonderful, clear and musical presentation of the accompaniments, with the balance between piano and bassoon acoustically “right on”. I recommend this finely crafted disc strongly to all bassoonists who enjoy hearing a true master playing their beloved instrument.